I’ve been discussing this with Avi in between work since we hired him last year, and have learned a great deal from this promising young (old) Institutional Economist! He’ll tell us about his PhD research at the University of Missouri at Kansas City (UMKC). 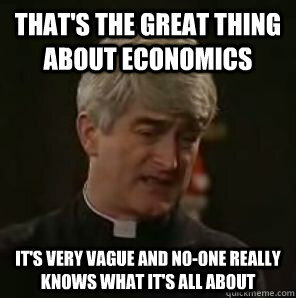 That’s the great thing about economics. It’s very vague and no-one really knows what it’s all about. Neoclassical and neo-Keynesian economics, though providing unlimited opportunity for the demanding niceties of refinement, has a decisive flaw. It offers no useful handle for grasping the economic problems that now beset the modern society.